BY BONNIE ZIEGELER 26 Mar. 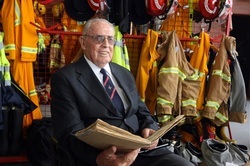 IT may have been half a century since Stan Nicol was named the first officer-in-charge at the Warrnambool Fire Brigade but no one can question his loyalty. The 88-year-old woke at 4am on Saturday to fly from his new home state of Queensland for the station’s 50th anniversary of the integration of career and volunteer staff. Mr Nicol was one of about 60 current and former members to attend the event, which marked a delayed 50 years since the beginning of paid firefighters at the south-west station. He and station officer Ern Bromley were the first two Warrnambool firemen to be affected by the statewide decision in 1961. Senior station officer David Ferguson and career firefighter Darren Brogden organised an afternoon tea at the Princes Highway station followed by a sit-down meal at the Warrnambool Bowls Club. “There were a few stories told,” Mr Brogden told The Standard yesterday Mr Brogden said the group enjoyed catching up and reminiscing but was disappointed more of their co-workers had not been able to show. “Most of the people are still employed as firefighters at other stations,” he said. “In our line of work, with the shift work, it makes it hard for everyone to attend. “They might be here (in Warrnambool) for one or two years, or six months or even five years before moving on to another station.” Mr Ferguson highlighted the strong relationships between past and present staff and volunteers. He said he was pleased to see Clive Rayner, Michael Corbett and Lance Baillie among the group of firefighters who remained active volunteers for the CFA. The Warrnambool Fire Brigade will celebrate its 150th anniversary next year. It was officially formed in 1863 following several failed attempts.